Building the House of God! Even though the rainy season has begun, we have been hard at work around the church cleaning, pulling weeds and vines, cutting up branches, and disposing of the waste. It is a mini-jungle out there! Physical work days continued with the arrival of Bro and Sis McGhghy from Cincinnati, OH. After visiting Haijima UPC in February, Sis McGhghy saw a need and determined she could help the kingdom of God. 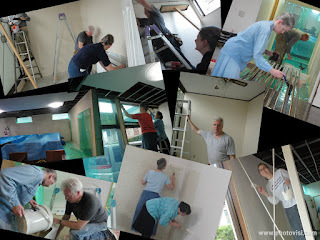 Using their vacation time and their own funds, she and her husband came to be a blessing by helping with the building project June 16-23, and a blessing they were! 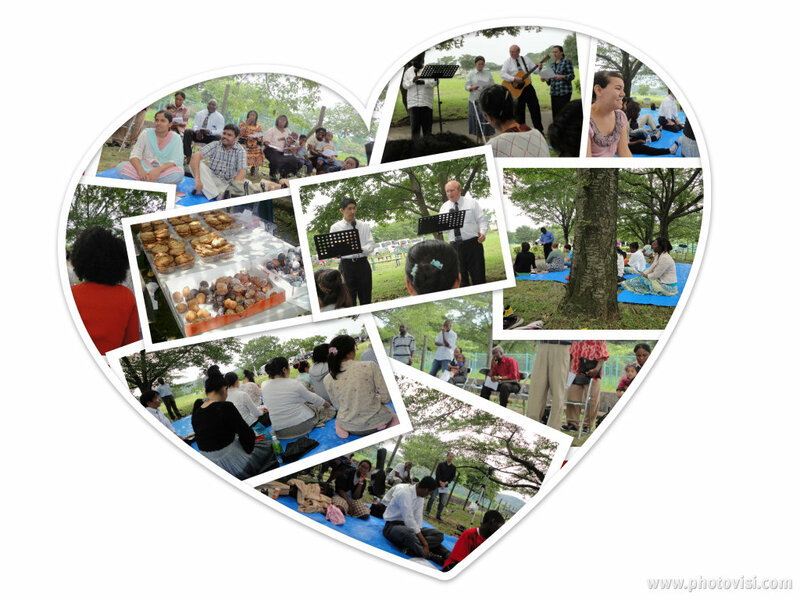 Both spoke to Haijima UPC's international and Japanese services, encouraging us to be used for "God's pleasure." Some of the tasks we accomplished were cleaning out the small rooms off the lobby, bundling up clothes and cardboard, cleaning fans, putting up ceiling tiles and ceiling wall trims in small rooms, painting the entire lobby texture, texture painting the entire sanctuary, and Bro Yokoyama's office is completely done including carpet... just needs the drapes to be hung! Due to the construction, we had a combined English and Japanese service in Fussa Minami park on June 24th (the same place we had our Hanami Rehai). The presence of the Lord was so sweet, and we also shared some sweets to eat. :) If you are friends with me on facebook, check out the video I posted. I just want to say how very blessed I am to hear the richness of the Word of God preached by Bro Lucas and the other ministerial leaders in the church. We can never take for granted the "foolishness of preaching."